With the continuing problems faced by Britain’s bee populations, now is a great time to think about what you’re planting in your garden. You can have a really beautiful, productive garden that also looks after the bees – just by well-planned planting choices and avoiding using pesticides. There’s a really great list of bee-friendly plants on the RHS website – Plants for Bees. And a less comprehensive seasonal list of plants for bees on the Gardener’s World website. I’m still looking for a list which tells you the flowering times of all the plants too, so that we can have a nearly-year-round bee friendly garden – I’ll post one if I find it! We’ve finally harvested the potatoes that we planted back in April – back before we even moved into the Eco-House. Having lovingly tended them for a very short period we then left them to be watered while we traipsed around the country for a couple of months. Now we’re settled we figured it was time to go back and harvest them! So, nearly 5kg of potatoes from an area of less than one square metre. It’ll be interesting to compare that with yields from our in-ground potatoes that we’ll be growing next year. If we were going to do it this way again, I wouldn’t bother with the kit – I’d buy some bags of compost and just use those. Just empty half the compost out, roll down the sided, punch holes in the bottom of the bag and put 2-3 seed potatoes in each bag. Roll up sides and add a couple of inches of compost each time you see shoots appearing – easy! The best thing about it (other than just eating delicious potatoes) is how excited the kids get about them. By growing them in bags we had a bit of an advantage – we could tip the whole bag into the wheelbarrow and let the kids root through it looking for potatoes. They loved it! Now we just have to decide if we’re going to try to grow some potatoes for Christmas. While we’re thinking about it, here are some pics of the potatoes growing. I haven’t got any showing the “jungle” they had become before harvesting unfortunately, but here are some of the progress shots! We had pretty good weather on the weekend for the polytunnel and got it about as far as I’d hoped. All the metal work is up – on Sunday we added the corner reinforcement, door bars and the crop bars (those horizontal bars that we’ll hang tomatoes, cucumbers and squash from). 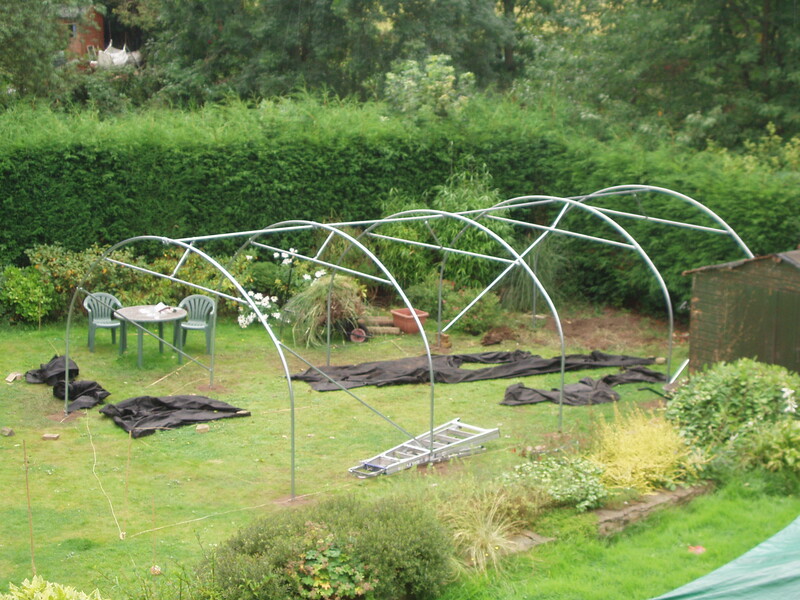 It’s looking quite impressive now – can’t wait to get the growbeds and fishtanks in! And the gravel has just arrived – 5 cu. metres – that’ll be fun to shift in our wheelbarrow! Blimey, what a day. Been hard at it since about 8.30 this morning (OK, we knocked off at 3.30 to go to the park). And we stopped for lunch. And a few drink breaks in there too. Now we’re making our own bread I thought it’d be worth working out how much cheaper / more expensive it is than just buying standard wholemeal bread. So here’s the standard pricing of all the ingredients – I haven’t started looking for cheap bulk supplies yet so these are just from Sainsbury’s. So in total it costs 78p, which is about the same price as a Sainsbury’s wholemeal loaf. Cost wise then it doesn’t make much difference – as long as you’re not making a separate journey to buy your bread, as once you start your car up the cost difference would be substantial! I’ll keep doing it because it tastes great, means we never run out, and it’s a good skill to have learnt for leaner times. I might also look for cheaper bulk ingredients. 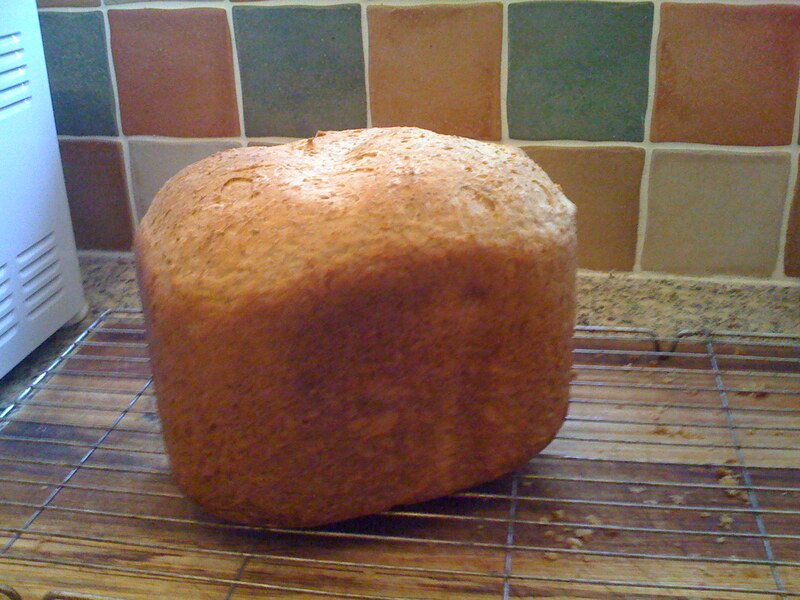 But I’ve used the new recipe three times so far and had no failures – just great, delicious wholemeal bread. It’s significantly lighter, and now there are not even the slightest complaints! It even seems easier to slice. Put the milk into the breadmaker, followed by the flour. Add the salt, sugar and butter into each corner, then make a well in the center of the flour (not all the way through to the milk) and pur in the yeast. Run it on the breadmaker’s express cycle. In our case that takes an hour, and only 0.24kWh. 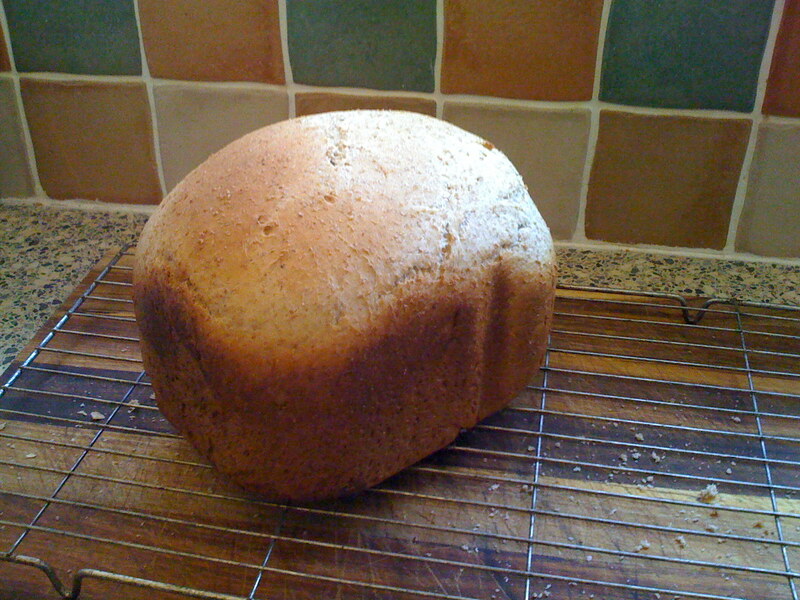 Anyway, that’s enough talking about it, I’m off to slice it up for breakfast – the smell is divine.